Every recruit to the SWP (if they still get recruits) should read this book before they pay their membership fees. It demolishes the illusion that the “Bolshevist Leninism” advocated in exile by Trotsky was somehow different from the murderous totalitarianism practised by Stalin. Aptly titled, The Tragic Procession is a fascinating and heartbreaking chronicle of the repression meted out to revolutionaries in Russia by the Bolshevik government, refracted through the pages of the Bulletin edited in exile by Alexander Berkman – issued first by his own Joint Committee for the Defense of Revolutionists Imprisoned in Russia, and from 1926 by the IWMA’s Relief Fund for Anarchists and Anarcho-Syndicalists Imprisoned or Exiled in Russia. Between February 1917 and the spring of 1918, Russian Anarchism enjoyed a legal existence for the first, and only, time in its history (prior to the collapse of the USSR). Though split on the question of support for the Bolsheviks, anarchists of all tendencies had taken part in the overthrow of Kerensky. They worked enthusiastically in the Soviets, and were represented in the All Russian Central Executive Committee (VTsIK). Many of them were captivated by Lenin’s writings after April, 1917, particularly his famous work “The State and Revolution”, which had re-examined Marx’s theory of the state and concluded that the existing bourgeois state must be abolished (along with the standing army, police and courts) and replaced with a society modelled on the Paris Commune. Believing the Bolsheviks to be sincerely dedicated to this task, Soviet Anarchists were even prepared to temporarily bend their anti-statist principles, in the cause of seeing the revolution triumph, by supporting the dictatorship of the proletariat. As the Soviet state grew stronger, the contradictions between Bolshevik and anarchist aims became more irreconcilable. On the night of 12 April, 1918, Lenin’s Cheka supported by Latvian riflemen, launched an offensive against the Moscow anarchists, with raids against twenty-six anarchist centres in the city, and closed down the printing presses of the Moscow Anarchist Federation and its paper “Anarkhiya”. Caught by surprise, some of the anarchists were captured without a shot being fired, or put up only a token resistance. Elsewhere, the well armed Black Guard detachments were only overcome by full-scale military assault. Those who still dreamed of seeing Anarchy in their lifetime pinned their hopes on a “third revolution” against Communist dictatorship, based on the Makhnovist insurgency in Ukraine and the Kronstadt revolt of 1921, but by the end of the 1920s the anarchist movement in Russia was completely outlawed. Alexander Berkman arrived in Russia with Emma Goldman in 1919, after being deported from the USA. At first they were inclined to give Lenin the benefit of the doubt. But the massacre at Kronstadt finally convinced them of the true nature of Lenin’s new autocracy. They were expelled to Germany in 1922, among the last of the Russian anarchists allowed to leave. From then on anarchists in Russia were subject to a continual cycle of repression, imprisonment and exile to remote provinces, where they were forced to survive as best they could. Berkman dedicated the remainder of his life to bringing practical aid and solidarity to the comrades he left behind. This book stands as testimony to his efforts. It would be difficult to do justice to the wealth of detailed information which the Bulletin published about persecuted Russian revolutionists (not only anarchists) – please, read the book yourself – while fellow-travelling intellectuals outside Russia were so besotted with the fatal attraction of Leninism. But a few gems beg to be mentioned in passing, if only because they are news to me. I didn’t know for instance (despite having written a book about Latvian anarchists) that the Latvian anarchist group in New York remained active, sending contributions to Berkman, as late as the end of 1930. Or that the London branch of the Anarchist Red Cross (Secretary E. Michaels) was still supporting Berkman’s work until at least 1931. An honourable mention (page 77) as another contributor, also in 1931, goes to Leah Feldman – a veteran of the anarchist underground in Russia and the Makhno movement in Ukraine, who in 1936 passed on the flame to our own Albert Meltzer (co-founder of the Anarchist Black Cross), and was still supporting anarchist action groups (First of May Group, Murray Defence Campaign) well into the 1960s and 70s. And it’s interesting to note that Nestor Makhno himself is listed (page 27) as receiving financial support ($76) from Berkman’s fund in 1926. Thus it was, inside and outside of the Gulag system, that against all odds anarchists survived in Russia until emerging in 1989 – not just despite, but in part precisely because of the repression of all who questioned the moral authority of a dictatorial state. The Tragic Procession of Russian Anarchism after 1918 was ultimately vindicated (thanks in no small part to people like Alexander Berkman) by outliving the dictatorship which sought to consign it, as Trotsky claimed, to the “dustbin of history”. [Philip Ruff is the author of Pa stavu liesmu debesis : Nenotverama latviešu anarhista Petera Maldera laiks un dzive [A towering flame : the life & times of ‘Peter the painter’] which was reviewed in our last issue. The Role of the Anarchists in the Russian Revolution and Civil War, 1917-1921: A Case Study in Conspiratorial Party Behavior during Revolution. John W. Copp. Ph.D. diss., Columbia University, 1992. Ultimately, he blames division among the anarchists for their failure to organise successfully: ‘While their individual responses were nearly always principled and often even heroic, the failure of their attempt to develop a national umbrella organisation and the contradictory responses of the anarcho-communists and the anarcho-syndicalists to the establishment of class institutions demonstrate the futility of the anarchists’ efforts to band together to produce their dream of revolution. Instead of seizing the revolutionary initiative or even responding to Bolshevik designs as a whole they were forced to battle piecemeal against whichever Bolshevik policies struck the members of a particular faction as wrong.’ (p212) This criticism was certainly repeated by some anarchists – Makhno for example. As we know (with hindsight) this cooperation led to both revolution and the Bolshevik seizure of power. Anarchists thereafter were divided on how to respond. Despite (because of?) their popularity the anarchist movement was eventually absorbed or repressed and sidelined. Copp’s account of the conflict anarchists had to face (loyalty to anarchism or to the revolution) is not just of historical interest. How do we stop revolution turning into its opposite? If there isn’t a single key to success, what combination of popularity, organisation, principle, ferocity and luck do we need? Goodwin examines different responses to Bakunin after the Russian revolution: celebration as revolutionary precursor; demonisation as the Anti-Marx; studied as the only way to even mention anarchist ideas. Chapter four (In defense of Bakunin: Aleksei Borovoi and the anarchist conception of Demons) covers the manoeuvres of anarchists in 1920s Russia. It disproves the idea that they simply disappeared, and provides information on exactly what they did do. The 50th anniversary of Bakunin’s death (the Bakunin jubilee of 1926) sparked new anarchist plans. Confronting Dostoevsky’s Demons is a specialised but intelligent and valuable contribution to the history of anarchism in Russia. Confronting Dostoevsky’s Demons : Anarchism and the Specter of Bakunin in Twentieth-century Russia by James Goodwin Peter Lang, 2010. ISBN: 9781433108839 £55/ $90. KSL: Bulletin of the Kate Sharpley Library No. 73, February 2013 has just been posted on the site. You can get to the contents here or read the full pdf here. Francesco Ghezzi was neither a thinker nor an ideologue. He was a worker who was an anarchist at age 16 and considered himself an anarchist for the rest of his life. In the 1920’s he was famous, and not just among anarchists and revolutionaries. On two occasions global campaigns were mounted in his defense: in 1923, when he was imprisoned in Germany and the Italian government demanded his extradition in order to put him on trial; and in 1929, when was convicted in the USSR (as a Soviet citizen) in the case of a group of anarchists associated with the Kropotkin Museum. In one of the letters from 1929 written in defense of Ghezzi (among the signatories was Romain Rolland), it was said about him: “This is a young Italian who enjoys the respect of everyone who knows him, who from earliest youth struggled for the emancipation of the proletariat and for implementation of the ideas of communism. <…> There can be no questioning the devotion of this blameless activist to the proletarian cause”. “Enjoying the respect of all who know him”, “devoted”, “blameless” – it’s impossible not to agree with this high praise after acquainting oneself with his case file of 1937 (when he was arrested for the second time in the USSR). A “case file” is not the place where a person tends to be presented in the best light. But even in the pages of Ghezzi’s file, he produces an impression of remarkable integrity, honesty (even a certain naïveté), and faithfulness to the ideas of anarchism. During his interrogation he frequently declared that from the age of 16 he “was a real anarchist with a developed worldview”, and that an anarchist “he was and would remain, and no one could change his convictions”. Italians repressed in the USSR in the 1930’s (including those who arrived through MOPR [International Red Aid]), were convicted under Article 58, Section 6, i.e. for espionage. Ghezzi, unlike other foreigners, was accused of “being a recalcitrant anarchist who carried on counterrevolutionary agitation directed against the politics of the CPSU(b) and the Soviet government, i. e. in crimes covered by Article 58, Sections 10 and 11”. We shall try to trace the life of this man, show what kind of problems he faced, how he coped with them, and also how his worldview was formed (of course, we must do so within the framework of a single case file). Francesco Ghezzi was born in Milan on October 4, 1893, into a working class family. He began working at age seven, and took part in the revolutionary movement from age 15. At age 16 he joined the anarchists and to the investigator’s question about his party affiliation (interrogation of January 4, 1938) he answered that he considered himself “a real anarchist with a consistent worldview from 1909” (in a questionnaire in the section on party membership he wrote: n/a). At the same interrogation he recounted his activism and his views, while his testimony was recorded by the investigator. “In Milan we organized strikes based on the workers’ economic demands. But when the police opened fire on our demonstrations, the economic demands were transformed into political ones. The strikes we organized were not always successful, and after every defeat there were mass arrests. Trying to avoid repression, I emigrated to France, to Paris, in 1914, but the following year when there was a mass exodus of Italian political emigrants back to Italy, I returned to Milan. The Milanese anarchist organization in that period adopted an anti-war platform and I worked with the Milanese anarchists to push for an uprising of the workers against the imperialist war. “In 1916, trying to escape from the police, I emigrated again, but this time to Switzerland where I took part in preparing an insurrection in Zurich. In 1918 I was arrested by the Swiss police and was held for eight months, accused of having contrived, along with the communist fraction of the social-democratic party, to launch an insurrection. Thanks to the pressure of public opinion, I was released. But within a day I was arrested again –for a protest action against the patriotic demonstration – and this time I was deported from the country. In 1919 I made my way to Paris. In 1920, as a result of a general amnesty, I was able to return to Milan”. trade unions must lead the struggle to overthrow the bourgeoisie, replacing its power not with a dictatorship of the proletariat, but with a free federation of unions. Furthermore, it was stipulated that anarchism be legally tolerated in the USSR. Ghezzi spent about three months in Moscow and then went to Berlin, where he took part in the congress of the anarcho-syndicalist International which took place in December, 1922. At this congress, Ghezzi made a report about the state of the anarcho-syndicalist movement in Italy. His presence in Germany was illegal, and soon after the congress he was arrested. The German authorities intended to hand him over to the Italian police to serve his sentence for belonging to an armed squad (according to his wife, Olga Gaake, Ghezzi had been sentenced in absentia to the death penalty by the Mussolini government), but communist newspapers of all countries, especially Humanité and Die Rote Fahn, although aware of his anarchist-communist views, warmly defended him. Ghezzi’s lawyer, Frenkel, was able to obtain proof that his client was a subject of the USSR. Thanks to this proof, Ghezzi was released from custody (he spent 9 months in jail), and in 1923, with a Soviet passport received through the Ministry of Foreign Affairs [Narkomindel] of the USSR, he arrived in the Soviet Union. Thus was concluded his most active period of revolutionary work, which involved not only anti-war protests and economic struggle, but also the creation of armed detachments. Ghezzi became a citizen of the USSR at the age of 30. Upon arriving in the USSR, from 1923 to 1926, he lived in Yalta and worked in an agricultural commune, the members of which were mainly Italian anarchists who had emigrated to the Soviet Union. Ghezzi considered himself empowered to write such a protest because he behaved in Soviet Russia like a free person who enjoyed the right to his own opinion. This perception of Ghezzi is expressed in one of the letters written in his defense: “… the USSR saved Ghezzi by accepting him as one of its own citizens. He settled in Russia in a situation where no one ordered him to renounce his personal convictions… it’s difficult to understand why he was forbidden to expression his opinions on the tactics and programs leading to the victory of the [proletarian] cause.” At that time, Ghezzi probably also did not understand “why he was forbidden”. While he was at the commune he received a visit from Trotsky’s daughter, which was also part of the charge against him in 1937, but, according to his statement, “this visit was personal and had no connection with Trotskyism”. In 1926 Ghezzi moved to Moscow. He did not break off contacts with anarchists abroad and carried on a wide-ranging correspondence on an international scale: he exchanged letters with Jacques Lenal (France), [Diego] Santillán (Spain), Errico Arrigoni (USA), Moravilla (editor of an anarchist newspaper in the USA), Luigi Fabbri (editor of an anarchist journal in Uruguay), etc. and received subscriptions to newspapers published abroad (including, of course, anarchist ones). At the same time he was active in Moscow anarchist groups and acted as a liaison between them and foreign anarchists. Thus, he forwarded the manuscript of A. A. Borovoi’s Ten Years of October abroad, and facilitated its return to the Soviet Union in the form of printed books. In January 1928 a terrific scandal broke out at the Kropotkin Museum – leading, in fact, to the demise of anarchism as a legal political, ideological and philosophical current in the USSR. The scandal was provoked by differences between A. A. Solonovich and A. A. Borovoi, mainly over the use of the auditorium. The Kropotkin Museum had its own library/reading room which attracted students and other young people and was suitable for holding public lectures and soirées. But the repercussions from this scandal were undoubtedly the result of other forces at work. In any case, Borovoi tried to create “a group of anarchists within the walls of the Kropotkin Museum which, in contrast to the mystical section, could expound and defend the concept of anarchism cleansed of alien influences”. Taking advantage of an occasion when the majority of the Scientific Section was absent, he added a group of anarchist-realists to its composition – 11 people in total. But at the very first session of the Executive Committee where these new members had to be confirmed, one of them (N. I. Rogdaev) was objected to both by Kropotkin’s widow (she referred to his past opinions about Kropotkin) and by Solonovich (he referred to Rogadaev’s opinion about Karelin). Next the anarcho-mystics who were members of the Executive Committee and had been absent when the new members had been voted in, demanded that the vote be annulled as illegal. In response Borovoi quit the Committee, and filed a protest on behalf of himself and the excluded anarchists (11 including Ghezzi). In the fall of 1928 a copy of this protest was sent to Delo Truda which carried on a vicious campaign over the following year aimed at exposing the anarcho-mystics led by A. A. Solonovich. These attacks were couched in terms which at the time could be considered snitching. In their own letters and declarations, the “rejects” did not disdain from disclosing that “of course we didn’t think of ourselves as scholars and had no intention of carrying on scientific work; we wanted only to oppose the distortion of anarchism”. The anarchists who left the Kropotkin Museum after the split formed a group in the spring of 1928. They made contact with P. Arshinov, who was editing the journal Delo Truda at the time in Paris. It was Ghezzi who carried on the correspondence with Arshinov. The latter sent his own organizational “Platform” which was studied by the group; the main activity of the group, in fact, was the study of this “Platform”. Andreyev spoke against forming a disciplined party and proposed organizing strictly underground small groups which, for purposes of conspiracy and possible misfortune must not be aware of one another. Furthermore, he spoke in favour of recognizing the possibility of exes and terrorist acts. Since the other members of the group didn’t agree with Andreyev, he broke with the group. Ghezzi left along with Andreyev. Later, in 1938, Ghezzi told his investigator that the disagreement was over “questions of discipline and some of the positions of the Platform”. But we don’t know what lies behind these words, and how he in fact related at the time to the notion of accepting exes and terrorism. Simultaneous with the organization of the group was the formation of a new alternative Black Cross, as a counterbalance to the existing Black Cross headed by Solonovich, which “it was decided to boycott and to launch an appeal to attempt to persuade all anarchists to observe this boycott”. The goal of this alternative Black Cross was to render assistance to anarchists in prison or exile. (At that time Solonovich’s Black Cross spent the funds collected on the Museum and on supporting needy anarchists.) The money was collected from anarchists both in Russia and abroad; the money coming from abroad went through Ghezzi. Since the new Black Cross, like the old one, was illegal – operating outside the framework of the law – the distribution was carried out through the Red Cross which treated the money from the Black Cross as if it had been received from private individuals. Ghezzi took care of the collection of funds and their transmission to the Political Red Cross. The anarchist R. M. Chembaryova, arrested in June 1929, told her interrogator: “After leaving the group, Ghezzi worked in the Black Cross, collecting money and materials received from abroad. He generally did not refuse to do any kind of work for the group which he was suited for, but stated that he wouldn’t be a member any more and wouldn’t sign any of the group’s declarations”. Ghezzi was among the twelve arrested and charged, like the rest of his comrades, with “being a militant anarchist who carried on counterrevolutionary agitation directed against the policies of the VKP(b) and the Soviet government”. By a resolution of a Special Board of the OGPU dated May 31, 1929, Ghezzi was sentenced to three years in a Correctional Labour Camp and transferred to the Suzdal Political Isolator. A public campaign in defense of Ghezzi was organized abroad. Petitions on his behalf were addressed to the ambassador of the USSR in Paris, Dobralevsky, by a Committee for Refugee Rights, an anarchist group from Liège, the lawyer Gustave Joly, and many others, including Romain Rolland (his letter of protest was signed by 16 other individuals). Rolland also wrote to Gorky, asking him to lobby for Ghezzi’s release and that he be allowed to leave the Soviet Union and either join his friends and wife in Paris or settle in another country of his own choice. Gorky did not consider the matter important and did not share Rolland’s enthusiasm for “the well known anarchist and revolutionary Ghezzi”. The policies applied by the Soviet authorities in dealing with the anarchists seemed quite reasonable to Gorky, and his differences with Rolland on this matter almost led to a severing of relations between them. But Gorky nevertheless queried not only Yagoda, but also Stalin, about the matter. A letter from P. P. Kryuchkov, dated March 5, 1930, informed Gorky that Yagoda’s response was that “it was absolutely impossible to release Ghezzi”. The end result of this campaign was that Ghezzi was released from prison, but was not allowed to go abroad. 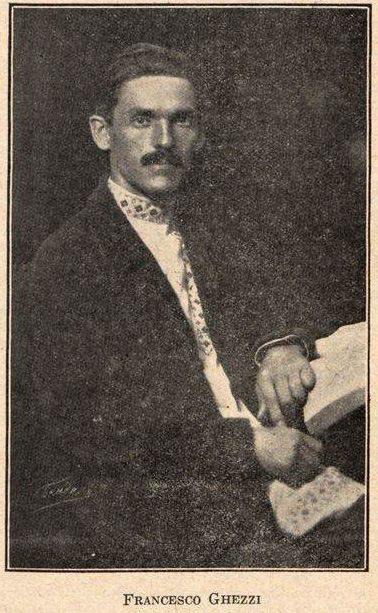 His release took place in two stages: first, by a resolution of a Special Board of the OGPU (January 3, 1931), he was released from the Suzdal isolator and sent to serve the remainder of his sentence in exile in Kazakhstan; two and a half months later, by another resolution of a Special Board (March 18, 1931), he was granted early release from exile and allowed to reside anywhere in the USSR. Ghezzi returned to Moscow and was able to get his old job back working as a quality control inspector at the State Factory for Test Instruments (GZIP). He didn’t alter his convictions, and in the bill of indictment of January 11, 1939, it was said about this period that: “After serving his sentence, Ghezzi, remaining true to the ideals of anarchism, … established connections with Italian anarchists; at the same he stayed in contact with anarchists in the USSR, and made his apartment available to anarchists who had escaped from exile. … Furthermore, in 1933 Ghezzi was in contact with the Trotskyist Gurevich and when the latter was arrested he tried to launch a campaign for his release through the Red Cross”. In a description of Ghezzi prepared by the plant where he worked after his arrest (signed by the plant director, the secretary of the Party Committee, and the chair of the trade union executive) and intended for the investigatory organs, was written: “He took part in social life; he worked with the engineers. Politically literate. By conviction, an anarcho-syndicalist. Working in the plant, he attended meetings of workers, however he refrained from speaking on political issues which, given his political awareness, can only be explained by his lack of agreement with the ongoing policies of the Communist Party and Soviet government”. “Ghezzi spread vile slanders about the leader of the workers Comrade Stalin. He told me that in France a biography of Stalin was recently published. “In this book,” he said, “you will find the whole truth about Stalin, namely that it was not he who made the revolution, rather those whom he condemns today. In this book it is written that when Lenin was dying, he said not to allow Stalin in the leadership”. I spoke to my union steward about this counterrevolutionary attitude, and he passed the information on to the Party organizer”. As we see, Ghezzi may have kept quiet at meetings, but he was anxious to share his personal views and talk about the books he was reading (more about them below) with the people around him. In the bill of indictment it says: “The eight witnesses questioned about the matter indicated that Ghezzi <…> carried on active counterrevolutionary agitation among the workers of the factory, propagandizing anarchism, and spreading calumny about the situation of workers in the USSR. At the same time he slandered the leadership of the Communist Party and the Soviet government. During the time when the trial of the counterrevolutionary Trotskyist Terrorist Centre was taking place, he agitated in defense of the enemies of the people”. In a protest directed to the Presidium of the Moscow City Court in 1956, the testimony of the witnesses (the basis for the charges) is described as follows: “[Ghezzi] spoke about the devastating material situation of the workers; he expressed his incomprehension of Soviet democracy in connection with the fact that there exists only one party; he voiced doubts about whether those who were being arrested by the NKVD were really counterrevolutionaries”. And further: “When the witness K. was re-interrogated in 1956, he changed his testimony significantly <…>, explaining this as being the result of threats by the investigating organs”. The investigation of Ghezzi was completed during the month after his arrest, and then more than a year passed without any action, although Ghezzi had agreed with the accusations presented to him as his very first interrogation. “I declare that I was and remain an anarchist, and that no one will change my convictions. “In 1929 <…> I said that labour in the USSR is miserably underpaid, and that the bureaucratism of the officials in charge makes the situation of the workers even worse. I then openly disagreed with the policies of the Party with respect to the pace of reconstructing the national economy, which led to an army of unemployed in the USSR. “<…> I admit and confirm that I was guilty of a number of anti-soviet opinions, such as not agreeing with the policies of the Party in relation to the trade unions in 1937. I said that there is no genuine democracy in Soviet trade unions, since in the USSR any kind of political tendency is persecuted”. On April 3, 1939, by a resolution of a Special Board of the NKVD, Ghezzi was sentenced to eight years imprisonment in a Corrective Labour Camp. Two weeks later he was sent in a transport to the Kotlas Station on the Gorkovskaya Railroad, where he came under the authority of the Chief of Administration of the Vorkuta Camp (Vorkutlag) of the NKVD. Ghezzi served his sentence in this camp. On January 13, 1943, by a resolution of a Special Board of the NKVD, Ghezzi was sentenced to be shot for anti-Soviet actions – for not only had he remained true to his personal convictions, he never altered his behaviour. But the death sentence was not carried out, because Ghezzi was already dead: his death certificate is dated August 3, 1942…. Leaflet: “The question of the anarchist program” – 1 piece. Various letters, in both Russian and foreign languages. Bakunin. “The Knouto-anarchist [sic] Empire” – 1 piece. Bakunin. “The State and Anarchism” – 1 piece. Bakunin. “Federalism, Socialism and Anarchy” – 1 piece. Bakunin. “The Policy of the International” – 1 piece. Kropotkin. “Mutual Aid: a Factor of Evolution” – 1 piece. Kropotkin. “Modern Science and Anarchy” – 1 piece. Kropotkin. “Memoirs of a Revolutionary” – 1 piece. Sebastien Faure. “The Universal Pain” – 1 piece. Borovoy. “Personality and Society in the Anarchist Worldview” – 1 piece. Korn. “Revolutionary Syndicalism and Anarchism” – 1 piece. Tucker. “Instead of a Book with Proudhonian quotations” [sic] – 1 piece. Ch. Fourier. “Collected Works” – 1 piece. A. Tun. “History of the Revolutionary Movement in Russia” – 1 piece. Jean Grave. “The Future Society” – 1 piece. M. Stirner. “The Ego and Its Own” – 1 piece. E. Malatesta. “Short Course on Anarchism” – 1 piece. Novomirsky. “From the Program of the Anarcho-syndicalists” – 1 piece. Elzbacher. “Anarchism” – 1 piece. Polonsky. “Bakunin” – 1 piece. James Guillaume. “The International” – 1 piece. “Shulgin’s Notes” – 1 piece. Shlyapnikov. “1917” – 1 piece. Karl Radek. “Portraits and pamphlets” – 1 piece. Élisée Reclus. “Revolution, evolution and the ideals of anarchism” – 1 piece. B. Chlenov. “The Moscow Okrana” – 1 piece. Kruchenykh, “The Death of Yesinin” – 1 piece. Foreign books – 10 pieces. This is the complete list of items. The letter in support of Ghezzi we have previously cited ends with the sentence: “He will doubtless always remain the same: a champion of all those who fight for the liberation of the working class”. This rather old-fashioned and pompous-sounding phrase (from the 1929 letter signed by Roman Rolland) nevertheless corresponds to the life lived by the “confirmed anarchist” Francesco Ghezzi. London’s Freedom Bookshop has suffered a firebomb attack. It looks as though lots of books have been damaged. “Our stock is somewhat reduced, but now features some interesting fire-damaged memorabilia. 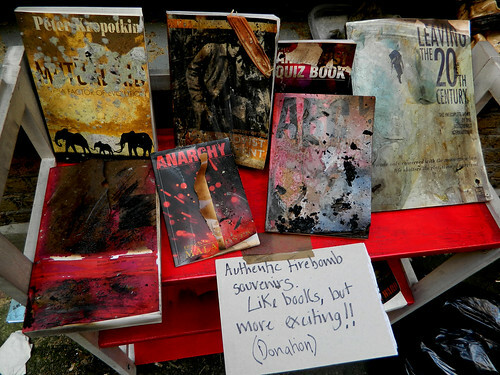 “As so much of our stock was damaged, we would appreciate any book donations you can make. “We are setting up a donation page. In the meanwhile, anyone who wants to donate can do so by ordering a book/s through the www.freedompress.org.uk website, and emailing us at shop@freedompress.org.uk to let us know that your purchase was a donation.